Huawei Y3 (2018) smartphone was launched in May 2018. The phone comes with a 5.00-inch touchscreen display with a resolution of 480x854 pixels. Huawei Y3 (2018) comes with 1GB of RAM. The Huawei Y3 (2018) runs Android 8.1 and is powered by a 2,280mAh removable battery. As far as the cameras are concerned, the Huawei Y3 (2018) on the rear packs 8-megapixel camera. It sports a 2-megapixel camera on the front for selfies. Huawei Y3 (2018) based on Android 8.1 and packs 8GB of inbuilt storage. Connectivity options on the Huawei Y3 (2018) include Wi-Fi and Bluetooth v4.00. Sensors on the phone include accelerometer, ambient light sensor, and proximity sensor. 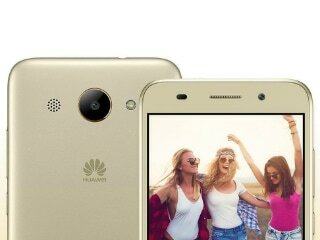 The Huawei Y3 (2018) measures 145.10 x 73.70 x 9.45mm (height x width x thickness) and weighs 180.00 grams. It was launched in White, Gold, and Grey colours. I quite like the performance of this phone thanks to its mediatek SoC which doesnt heat up even with heavy usage! It is a good phone with good battery back-up and nice camera. MediaTek chipset makes it work very efficiently.